Bhut jolokia are aptly nicknamed ghost peppers because they are so spicy. This pepper variety is, in fact, one of the hottest on the planet. The peppers are 2 to 3 inches long and reddish orange in color. On the Scoville scale, a range that identifies how spicy a pepper is, bhut jolokia reaches a rating of 1.35 million Scoville units. For comparison, a jalapeno has a rating of 2,500 to 8,000 Scoville units. Eating such spicy peppers can be risky for a number of reasons. Eating bhut jolokia is tricky because when you first put it in your mouth, it has a sweet flavor. About 45 seconds after putting in your mouth, the fiery sensation starts and continues to intensify for 10 to 15 more minutes. The fiery sensation begins to fade about a half hour after starting to eat a bhut jolokia pepper. Digonta Saikia, an Indian farmer who grows ghost peppers, told NBC News that eating one of the chilies is "like dying" because they are so intensely spicy. At the very least, you'll experience a painful, stinging sensation on your tongue when you eat a ghost pepper. Your lips, gums and inside of your mouth will likely sting quite painfully as well. Eating just a small piece can also make your eyes water. 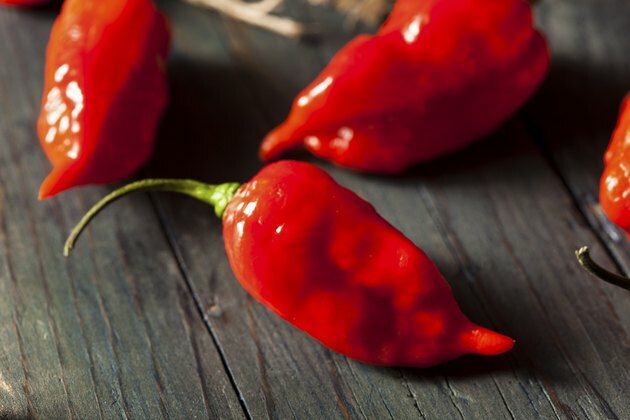 Your upper body might break into a sweat and your heart might beat faster when you eat bhut jolokia, according to the "Wall Street Journal." The compound responsible for the heat in peppers is called capsaicin. Eating capsaicin can cause gastrointestinal irritation, resulting in stomach discomfort and diarrhea. If you're allergic to latex or certain foods, such as bananas, avocado, kiwi fruit chestnuts, you may be more likely to have an allergy to capsaicin, according to Drugs.com. Difficulty breathing can occur immediately after ingestion of bhut jolokia. Inhaling the fumes of ghost peppers may cause cough, sneezing and rhinitis. Always wear gloves when handling bhut jolokia. If you get the oils from the peppers on your hands and then touch your eyes, lips or other parts of body, you'll experience a painful burning sensation there as well. If you want to sample a ghost pepper, don't stick the entire thing in your mouth at one time. Just the tiniest piece is enough to cause symptoms, so start very small if you're brave enough to give the peppers a try. Before doing so, however, speak to your doctor to be sure the peppers are safe for you.